Kilimanjaro - 8 days trekking up Mount Kilimanjaro and reaching the summit at Uhuru Peak on Valentine's Day, 2019. 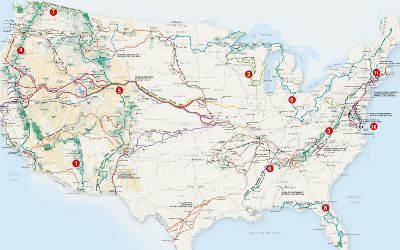 These are the long trails I would like to complete over the years. The trail miles are rounded estimates and you'll see different miles other places. Pacific Northwest NST - COMPLETED - 1200 miles - July-September 2017, through the mountains where I grew up. Florida NST - 1100 miles - snakes, panthers, swamps, and insects. Hiked 100 miles from Key West to Key Largo, then from southern FT terminus up to Ocala. I'll return to finish it someday, but just sooooo many miles of high traffic roads. Appalachian NST - 2200 miles - I've done two section hikes on the A.T. for a total of about 425 miles. Ice Age NST - COMPLETED - 1100 miles - August-September 2013 - Close to home and I had relatives at two locations along the trail for support while I hiked across Wisconsin with PapaBear. Superior Hiking Trail - COMPLETED - 250 miles - September 2012 - hiked from Canada south to Duluth, MN. September had no bugs nor humidity, just a bit of rain, and awesome fall colors in the forests. This isn't a National Scenic Trail, but is part of the NCT and I was antsy to do another trek before winter. Arizona NST - COMPLETED - 800 miles - March-April 2012 - requires hiking early in the season since water is scarce and heat is intense as summer approaches. Provides a great opportunity to test out equipment, abilities, endurance, and processes. Lets me be home for my youngest son's high school graduation. Pacific Crest NST - 2600 miles. Continental Divide NST - 3100 miles. This is the most rugged and difficult of all the national scenic trails. North Country NST - 4600 miles. The longest NST by far, but relatively flat terrain from the northern prairies to the northeast forests. From initial research I've done, there's little camping and connecting routes for the last three and thru-hiking them takes support for lodging. Connect with scouts - Scout troops along my treks are invited to hike with me for a couple hours or days. I'll have a tracking device so folks can see where I am. That's Boy Scouts, Girl Scouts, or (what the heck) anyone that wants to do a short hike. Promote lighter-weight trekking. When scouts try to Be Prepared, we overpack and make life more difficult than needed on the trail. I'll be an example of how to go light but still be comfortable and safe. Promote Leave No Trace. I always try to follow the ethics of the seven LNT principles, but they are still unknown to many people that make use of our wild areas. I'll consistently demonstrate the outdoor ethics of minimizing impact. Read more about Leave No Trace. Record the Fun - through blogs, reports, stories, and journals I'll track and share the experience, providing a resource to help others planning their own adventures. Your itinerary looks like something I'd put together. I'd love to do all of them, too. If only I were independently wealthy. Nancy - if the passion or desire to do something is strong enough, it can usually be worked out. Maybe a different form than first thought, but still done. Section hiking long trails is a common way to break them into shorter hikes, for example. I'm doing the shorter AZT now because that's all I have time for until late summer. good plan.... im doing something along same way.... but im doing 1500 of the A.T starting end of may..
Way to try and get scouts to stop overpacking. My brother has often complained that when they go on single day trips, boys don't enjoy it because they're carrying fifty pound bags. Long live light weight! Karolina - I give +1 for dry socks! I'm just heading out on an 8-mile walk right now and have new possom socks from New Zealand that I'm trying out. Don't forget about the Long Trail in Vermont. The Northern section is some of the best hiking in the East. I am planning to hike the Arizona trail, north bound, in April. I have been looking at the water sources which are rated in the guide book from 1 to 4. I am thinking that I cannot trust a 1 or 2 and I see it is often 30 or 40 miles between 3's and 4's. Caching water is not an option. Any suggestions? Hiking Dude, Thanks for the quick response. I was thinking pretty much the same thing. Water up at every source and hike some extra miles. I'm thinking one liter for every ten miles, one liter for every 1000 ft. of elevation and a half liter emergency on the long hikes. I'm a boyscout from maine and this may my troop is going to a camparee that West Point is putting on and we have to hike in and we stay for 3 nights. We have to bring our own gear. Should I need trekking poles? If so what do you recomend. Also what are some good snacks I can bring? @Justin - For such a short hike, poles seem unnecessary unless you are also using them as supports for your tarp shelter or other use. See hiking food page for snack ideas. Do you have any idea when you plan to do the 220 mile New England NST? I live in NY and would love to do something like that. I'm not terribly experienced and have never done a trip that long, but would love to try it. @Kim - I believe doing that trail would require support since there is little camping opportunity along it. Or, running into lots of friendly people who let you sleep in their yards since it crosses lots of roads and private property. Or, lining up many hotels along the way that would shuttle you to and from the trail since it is rarely far from some town. See this map to see the few overnight spots. I googled trying to find more information on some of these trails and must recently found you site. NICE! Someday I too would like to do at least a couple of such trails. 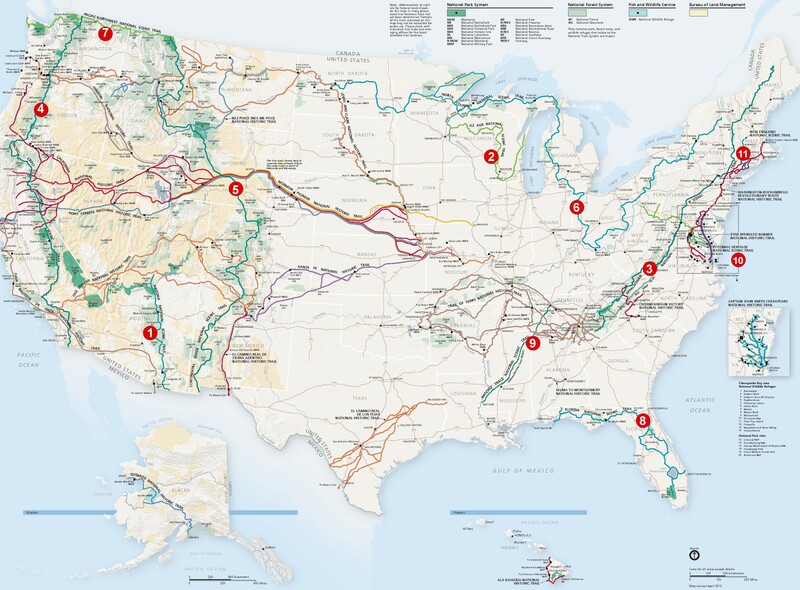 Then to I might also like to just try to bike across the USA, just as another CRAZY idea! Both interest me, but presently I am working full time and perhaps some day, 1st day after when I retire, I could get the chance to do these crazy activity. Nice way to stay healthy. Right! But I did really enjoy looking over what you had and how you would do, or how you did trail that far. So what trail are you working on now? What trails have you completed and are you doing them all as "one and done", OR will you walk all the FUN ones again. PS if I get that far, I would like to be a trail Amature Radio out too! Found your site looking for SHT info. Hoping to head that way in Sept of 2016. Next time you get out East check out the Long trail in Vermont. I did it for my 40th birthday present to myself, tough hiking but lots great views and just the right amount of solitude, until I got on the AT part anyway. You gonna earn your Triple Crown? @Allan - Good Question. :-) The AT is soooo crowded I don't expect I will hike it unless someone else wants to do it and wants me to join them. There are miles and miles of other beautiful trails across the country and around the world that I'd love to hike. I would like to hike all the National Scenic Trails eventually, but it's not to get the TC medal for me.